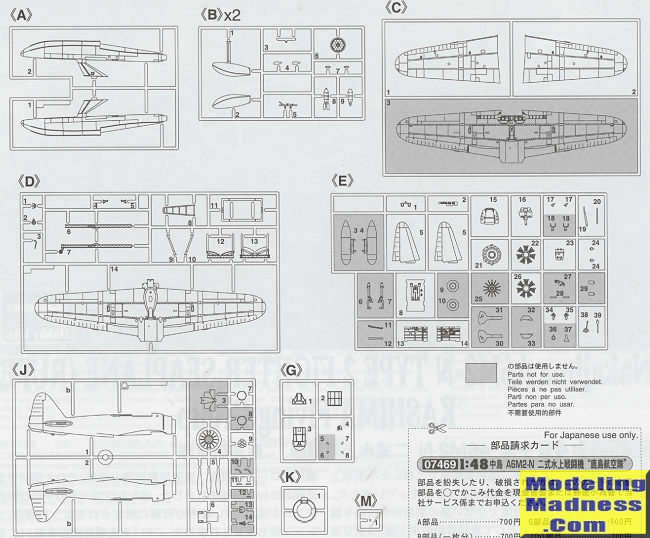 The history of the A6M Zero-Sen has been well documented in other reviews. 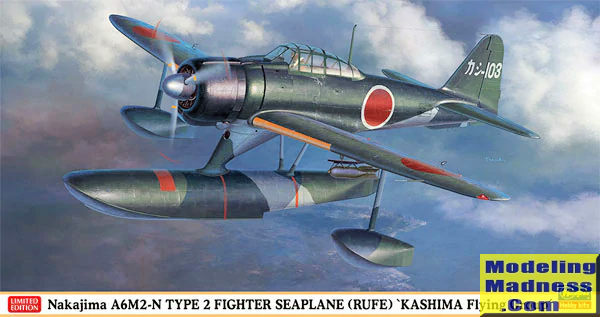 The floatplane fighter version, Allied code-named 'Rufe' was developed by Nakajima in response to a request by the Japanese Navy for a float fighter based on the A6M2. This was mainly due to the Japanese inability to quickly build runways. There was no Japanese equivalent of the Seabees to do this. Therefore the need for defending fighters that could take off from and land on the water to defend any newly acquired ocean-front property. Like their seaplane buddies, many 'Rufe' units operated from a tender. While a new fighter specifically designed for this purpose, the Kawanishi N1K1 'Rex' was being developed, it would be years before it was operational. Undertaking the job of converting the A6M2, Nakajima had a prototype flying in less than a year from initial development, first flying on 7 December 1941. There were 327 'Rufes' built and they saw action in nearly all theaters of the war in the Pacific, being used right up until the end of the war. The first deployment of the type was to a sleepy little bug-infested island in the Southwest Pacific called Tulagi, across a strait from a larger, even more inhospitable place that no one ever heard of called Guadalcanal. Where enemy fighter opposition was light or weak, the 'Rufe' did well. Even against more advanced types, 'Rufe' pilots were able to score well and a few 'Rufe' pilots became aces. The Japanese Navy established the Kashima Air Group seaplane training base on Lake Kasumigaura in 1938. As the war progressed, the group added interceptor missions, reconnaissance missions, and patrol missions to its duties. This due to its relative closeness to the capitol as much as anything. Lake Kasumigaura (霞ヶ浦 Kasumigaura) is the second-largest lake in Japan, located 60 km to the north-east of Tōkyō. Lake Kasumigaura originally was a brackish-water lagoon, with indirect connections to the Pacific Ocean via the Hitachigawa and Tone Rivers. In 1963, the construction of a gate near the confluence of these rivers disconnected the lake from its sources of ocean water. As a result, the salinity of Lake Kasumigaura declined, and today the lake contains fresh water. This lake was famous for its traditional fishery during the Edo period. But today, fishing production has drastically decreased due to water quality deterioration that was partially caused by the closure of the tide gate in 1963 for purposes of desalination. This is one of Hasegawa's many Limited Edition boxings that vary from the base kit only by a box art and decal change. The development of the 'Rufe' required an additional sprue or two to deal with the floats, the major addition being a new lower wing, new fuselage halves, and a beaching dolly so it could be properly displayed. 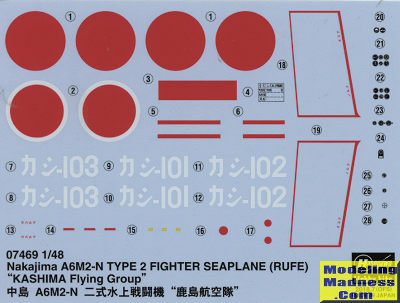 In usual Hasegawa form, you get a very complete cockpit that uses decals over raised instrument panel detail as well as nicely done sidewalls. This is trapped between fuselage halves and the upper cowling added in place. The engine is four pieces with the gearbox piece including pushrods. Since the one-piece cowling is so tight fitting, no exhaust piping aside from the end pieces is required. The lower wing requires holes to be opened if you wish to install the bomb racks. You also need to fill in the aileron trim tab panel lines and one other panel not found on the Rufe. The best place to put weight on this kit is in the front of the main float and 16 grams (not a small amount) is required. If using the bombs, you'll find each bomb and rack assembly is seven parts. There are braces and a ladder that fit onto the float prior to attaching it to the fuselage. The canopy is several pieces as is the prop assembly with separate blades. A nice ten piece beaching dolly is provided so you can display your completed model. Standard fare for the instructions with Gunze paint references. All three options are in Nakajima green uppers with grey-green undersides. The wing leading edge is in yellow, and the cowling black. Even though the planes were built by Nakajima, the instructions call for the darker Mitsubishi interior green, which I think is a bit odd. The only difference in the three options is the tail code so take your pick. The decals are superbly done and will work as well as any aftermarket set. There are aftermarket decals available for this kit, but then what would be the purpose of buying a limited edition boxing? No surprises here. Another fine boxing of what is a great kit of this type. Those wanting to save some $$ will go for the much older Tamiya version, which isn't all that bad. But those who want the best on the market in this scale will grab one of these. Thanks to me for getting this one.